Health 11 Edition Note: You are purchasing a standalone product; MasteringHealth does not come packaged with this content. If you would like to purchase both the physical text and MasteringHealth search for ISBN-10: 0321908724/ISBN-13: 9780321908728. That package includes ISBN-10: 0321910427/ISBN-13: 9780321910424 and ISBN-10: 0321948742/ISBN-13: 9780321948748. MasteringHealth is not a self-paced technology and should only be purchased when required by an instructor. xxxxxxxxxxxxxxxxxxxxxxxxxx For Personal Health Courses Connecting Your Health to Your World—The Money and Technology Edition Health: The Basics, Eleventh Edition focuses health coverage on real-world topics that have the greatest impact on your life, bringing health topics to life and keeping you hooked on learning and living well. This text addresses students’ diverse needs and learning styles with new Video Tutors and the new MasteringHealth™ Along with its dynamic new content and technology, this book retains its hallmarks of currency, excellent research, strength in behavior change, attractive design, imaginative art, and unique mini-chapters. This program presents a better learning experience for you. 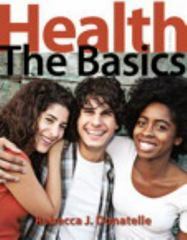 Health: The Basics, Eleventh Edition will: Personalize learning with MasteringHealth: MasteringHealth coaches you through the toughest health topics. Engaging tools help you visualize, practice, and understand crucial content, from the basics of health to the fundamentals of behavior change. Cover health topics with a real-world focus: Money and Technology are two of the timeliest issues arising in health today and are addressed through the new Money & Health and Tech & Health boxes. A new mini-chapter targets financial challenges you face every day, such as budgeting, scams, and debt. Make health mobile: Video Tutors throughout the text present key figures or points of discussion in an engaging video. QR codes make these short videos easily viewable from a smartphone, tablet, or laptop. Encourage critical thinking and behavior change: Learning Catalytics™ is a ”bring your own device” student engagement, assessment, and classroom intelligence system that enables your instructor to assess you in real time, improving your critical-thinking skills, access rich analytics, and more.